Bob Cohen, a young American Peace Corps worker living in India, decides to visit some of his countrymen—members of the International Society for Krishna Consciousness—who are establishing an international spiritual community near the birthplace of Chaitanya Mahaprabhu. To his surprise, he is invited to meet the founder and spiritual leader of the Hare Krishna movement, His Divine Grace A.C. Bhaktivedanta Swami Prabhupada. For several days, in a small, brick and thatch hut near the banks of the holy Ganges, Bob asks Srila Prabhupada every question on spirituality he can think of. A tape recorder is running the whole time, and later their conversation is transcribed. 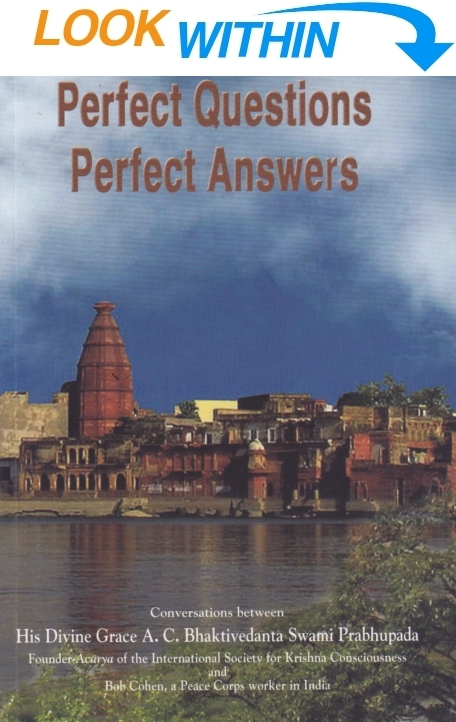 Once suggested to be entitled, "A Funny Thing Happened To Me On The Way To The Ganges," Perfect Questions, Perfect Answers has been reproduced in forty languages and remains one of the most popular introductions to Krishna consciousness across many languages and cultures. Bob: If a person who wants to become rich prays to Krishna, will he become rich? Bob: He can become rich through this means? Srila Prabhupada: Oh, yes. Because Krishna is all-powerful, if you pray to Krishna to become rich, Krishna will make you rich. Bob: If somebody lives an evil life but prays to become rich, he may still become rich? Srila Prabhupada: Yes. Praying to Krishna is not evil. Srila Prabhupada: [chuckling] Somehow or other he prays to Krishna, so you cannot say that he is evil. Srila Prabhupada: Krishna says in Bhagavad-gita, api cet suduracaro bhajate mam ananya-bhak [Bg. 9.30]. Have you read it? Bob: Yes. The Sanskrit I don’t know, but the English I do. Srila Prabhupada: Yes. As soon as he begins to pray to Krishna, that is not evil. Therefore He is all-attractive. It is said in the Vedas that the Absolute Truth, or the Supreme Personality of Godhead, is the reservoir of all pleasure— raso vai sah. (Taittiriya Upanishad 2.7.1) Everyone is hankering after someone because he realizes some mellow in it. Srila Prabhupada: Some mellow. Suppose a man is drinking. Why is he drinking? He is getting some mellow out of that drinking. A man is hankering after money because by possessing money he gets a mellow out of it. Bob: What does mellow mean? Srila Prabhupada: [to Shyamasundara] How do they define mellow? Srila Prabhupada: Pleasing taste. So the Vedas say, raso vai sah. The exact translation of mellow is rasa. [Malati, Shyamasundara’s wife, enters with a tray of food] What is that? Shyamasundara: How is Krishna the greatest scientist? Srila Prabhupada: Because He knows everything. A scientist is one who knows a subject matter thoroughly. He is a scientist. Krishna—He knows everything. Bob: I am presently a science teacher. Srila Prabhupada: Yes, teaching. But, unless you have perfect knowledge, how can you teach? That is our question. Srila Prabhupada: That is cheating; that is not teaching. That is cheating. Just like the scientists say, “There was a chunk… and the creation took place. Perhaps. Maybe…” What is this? Simply cheating! It is not teaching; it is cheating. Bob: You said when Jesus came the people then were somewhat more ignorant and needed miracles as aid. I wasn’t sure if that’s quite what you said. Srila Prabhupada: Yes, yes. Miracles are for the ignorant. Bob: I had asked this in relation to all the miracle men you hear about in India. Srila Prabhupada: Krishna is the highest miracle man. Srila Prabhupada: You can teach up to the point you know. Bob: Yes, but I should not claim to teach more than I know. Srila Prabhupada: Yes, that is cheating. Shyamasundara: In other words, he can’t teach the truth with partial knowledge. Srila Prabhupada: Yes. That is not possible for any human being. A human being has imperfect senses. So how can he teach perfect knowledge? Suppose you see the sun as a disc. You have no means to approach the sun. If you say that we can see the sun by telescope and this and that, they are also made by you, and you are imperfect. So how can your machine be perfect? Therefore, your knowledge of the sun is imperfect. So don’t teach about the sun unless you have perfect knowledge. That is cheating. Bob: But what about to teach that it is supposed that the sun is 93,000,000 miles away? Srila Prabhupada: As soon as you say “it is supposed,” it is not scientific. Bob: But I think that almost all science, then, is not scientific. Srila Prabhupada: That is the point! Bob: All science is based on, you know, suppositions of this or that. Srila Prabhupada: Yes. They are teaching imperfectly. Just like they are advertising so much about the moon. Do you think their knowledge is perfect? Bob: What is the proper duty of the teacher in society? Let us say a science teacher. What should he be doing in the classroom? Srila Prabhupada: Classroom? You should simply teach about Krishna. Srila Prabhupada: No. That will include everything. His aim should be to know Krishna. Bob: Can a scientist teach the science of combining acid and alkaline, and this kind of science, with Krishna as its object? Srila Prabhupada: How can it be? Bob: If you—when one studies science, one finds general tendencies of nature, and these general tendencies of nature point to a controlling force…. Srila Prabhupada: That I was explaining the other day. I asked one chemist whether, according to chemical formulas, hydrogen and oxygen linked together become water. Do they not? Srila Prabhupada: Now, there is a vast amount of water in the Atlantic Ocean and Pacific Ocean. What quantity of chemicals was required? Srila Prabhupada: Yes. How many tons? Srila Prabhupada: So who supplied it? Bob: This was supplied by God. Srila Prabhupada: Somebody must have supplied it. Srila Prabhupada: So that is science. You can teach like that. Bob: Should one bother teaching that if you combine acid and alkaline they form a neutral? Bob: So this comes from the same source as the water. Srila Prabhupada: Yes. You cannot manufacture water unless you have hydrogen and oxygen. So, here is a vast—not only this Atlantic or Pacific: there are millions of planets, and there are millions of Atlantic and Pacific oceans. So who created this water with hydrogen and oxygen, and how was it supplied? That is our question. Somebody must have supplied it, otherwise how has it come into existence? Srila Prabhupada: So I am creating some energy, and therefore my body is maintained. Srila Prabhupada: So therefore your body is made out of your energy. Bob: But when you eat the food, there is energy from the sun in the food. Bob: I’ll have to think about it to follow that. Srila Prabhupada: What is to follow? It is a fact. [He laughs.] Your hair is growing daily. Why? Because you have some energy. Bob: The energy I obtain from my food. Srila Prabhupada: Somehow or other you have obtained that energy! And through that energy your hair is growing. So if your body is manufactured by your energy, similarly the whole gigantic manifestation is made of God’s energy. It is a fact! It is not your energy. Bob: Yes. Oh, I see that. A devotee: Just like—aren’t the planets in this universe the sun’s energy—a product of the sun’s energy? Srila Prabhupada: Yes, but who produced the sun? That is Krishna’s energy. Because it is heat, and Krishna says, bhumir apo ’nalo vayuh: [Bg. 7.4] “Heat—that is My energy.” The sun is the representation of the heating energy of Krishna. It is not your energy. You cannot say, “The sun is made by me.” But somebody must have made it, and Krishna says that He did. So, we believe Krishna. Therefore we are Krishna-ites. Srila Prabhupada: Yes. Our knowledge is perfect. If I say that heat is the energy of Krishna, you cannot deny it, because it is not your energy. In your body there is some certain amount of heat. Similarly, heat is someone’s energy. And who is that person? That is Krishna. Krishna says, “Yes, it is My energy.” So my knowledge is perfect. Because I take the version of the greatest scientist, I am the greatest scientist. I may be a fool personally, but because I take knowledge from the greatest scientist, I am the greatest scientist. I have no difficulty. Bob: They are separated energies? Srila Prabhupada: Yes. Just like this milk. What is this milk? The separated energy of the cow. [Shyamasundara and Bob, stunned, laugh in realization.] Is it not? It is the manifestation of the separated energy of the cow. Shyamasundara: Is it like a by-product? Bob: So, what is the significance of this energy’s being separated from Krishna? Srila Prabhupada: “Separated” means that this is made out of the body of the cow but it is not the cow. That is separation. Bob: So, this earth and all is made out of Krishna but it is not Krishna? Srila Prabhupada: It is not Krishna. Or, you can say, Krishna and not Krishna simultaneously. That is our philosophy. One and different. You cannot say that these things are different from Krishna, because without Krishna they have no existence. At the same time, you cannot say, “Then let me worship water. Why Krishna? The pantheists say that because everything is God, whatever we do is God worship. This is Mayavada philosophy—that because everything is made of God, therefore everything is God. But our philosophy is that everything is God but also not God. Bob: So what on earth is God? Is there anything on earth that is God? Srila Prabhupada: Yes. Because everything is made out of the energy of God. But that does not mean that by worshiping anything you are worshiping God. Srila Prabhupada: Yes. Maya—and another meaning is “illusion.” So foolish persons accept the energy as the energetic. That is maya. Just like sunshine. Sunshine enters your room. Sunshine is the energy of the sun. But because the sunshine enters your room, you cannot say that the sun has entered. If the sun enters your room, then your room and yourself—everything—will be finished. Immediately. You will not have the leisure to understand that the sun has entered. Is it not? Srila Prabhupada: But you cannot say that sunshine is not the sun. Without the sun, where is the sunshine? So you cannot say that sunshine is not the sun. But at the same time, it is not the sun. It is the sun and not the sun—both. That is our philosophy. Achintya-bhedabheda—inconceivable. In the material sense, you cannot conceive that a thing is simultaneously positive and negative. That you cannot think of. That is inconceivable energy. And because everything is Krishna’s energy, Krishna can manifest Himself from any energy. Therefore, when we worship Krishna in a form made of something—of earth, water or something like that—that is Krishna. You cannot say that it is not Krishna. When we worship this metal form of Krishna [the Deity form in the temple], that is Krishna. That’s a fact, because metal is an energy of Krishna. Therefore, it is nondifferent from Krishna, and Krishna is so powerful that He can present Himself fully in His energy. So this Deity worship is not heathenism. It is actually worship of God, provided you know the process. Bob: If you know the process, then the Deity becomes Krishna? Srila Prabhupada: Not becomes—it is Krishna. Bob: The Deity is Krishna, but only if you know the process? Srila Prabhupada:Yes. just like this electric wire—it is electricity. One who knows the process, he can derive electricity out of it. Shyamasundara: Otherwise it’s just wire. God, spiritual life—those were such vague terms to me before I met Srila Prabhupada. I have always been interested in religion, but before I met the Krishna conscious devotees, somehow I did not have the proper perspective needed to inquire fruitfully about spiritual life. The existence of a Creator is only common sense—but who is God? Who am I? I had been to Hebrew School and had studied Oriental philosophy, but I could never get satisfying answers to my questions. I first heard the Hare Krishna mantra in Greenwich Village, New York, in late 1968. The chanting was captivating, and it made me feel very comfortable. The mantra stuck in my mind, and I soon regretted that I had not taken a magazine from the devotees. As explained to me later, a transcendental seed had been planted that could eventually ripen into love of Godhead. Several months later, I came across a card with the Hare Krishna mantra on it. The card promised, “Chant these names of God, and your life will be sublime!” I would occasionally chant, and I found that the mantra did, in fact, give me a feeling of peace of mind. After graduating from college with a B.S. in chemistry, I joined the Peace Corps in 1971 and went to India as a science teacher. In India I inquired about the Hare Krishna movement. I was attracted by the chanting and intrigued by the philosophy, and I was curious about the movement’s authenticity. I had visited the Krishna temple in New York several times before going to India, but I did not consider the seemingly austere life of a devotee for myself. In India I first met the Krishna conscious devotees at a festival they were holding in Calcutta during October of 1971. The devotees explained to me the purpose of yoga and the need to inquire about spiritual life. I began to feel that the rituals and ceremonies they practiced were not dull, sentimental obligations, but a real, sensible way of life. In February of 1972, I met some devotees in Calcutta who invited me to a festival in Mayapur (a holy island ninety miles to the north). The festival was to be held in honor of Lord Chaitanya Mahaprabhu, who is considered an incarnation of Krishna Himself. I had then been planning a trip to Nepal, but the Peace Corps denied me permission to leave India, and so I went to Mayapur. I left for Mayapur planning to stay for two days at the most, but I ended up staying a week. I was the only Western nondevotee on the island, and since I was living with the devotees on their land, this was a unique opportunity to learn intimately about Krishna consciousness. On the third day of the festival, I was invited in to see Srila Prabhupada. He was living in a small hut—half-brick and half-thatched, with two or three pieces of simple furniture. Srila Prabhupada asked me to be seated and then asked how I was and whether I had any questions. The devotees had explained to me that Srila Prabhupada could answer my questions because he represents a disciplic succession of spiritual masters. I thought that Srila Prabhupada might really know what is going on in the world. After all, his devotees claimed this, and I admired and respected them. So with this in mind I began to ask my questions. Inadvertently, I had approached a guru, or spiritual master, in the prescribed way—by submissively asking questions about spiritual life. Srila Prabhupada seemed pleased with me, and over the next several days, he answered my questions. I asked them mostly from an academic point of view, but he always gave me personal answers so that I would actually spiritualize my life. His answers were logical, scientific, satisfying and amazingly lucid. Before I met Srila Prabhupada and his disciples, spiritual life was always obscure and nebulous. But the discussions with Srila Prabhupada were realistic, clear and exciting! Srila Prabhupada was patiently trying to help me understand that Krishna—God—is the supreme enjoyer, supreme friend and supreme proprietor. I put forward many impediments to accepting the obvious: that I would have to become serious about God consciousness to understand God. But Srila Prabhupada relentlessly yet kindly urged me on. Even though I had little ability to express myself, Srila Prabhupada understood my every inquiry and answered perfectly.